6.96 carats T.W. of sheer glamour. 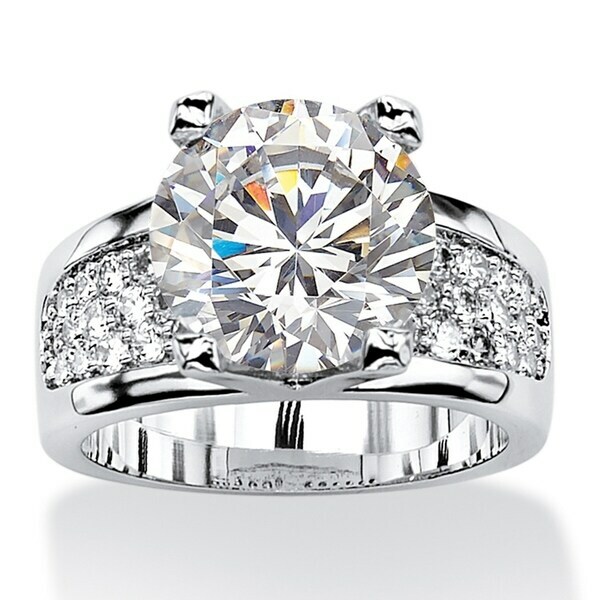 The main stone is a stunner that will dazzle any bride or bride-to-be. Platinum-plated. Sizes 5-10. 37 Cubic Zirconias, 6.96 carats T.W. Dimensions 1.1 In. X 0.47 In. X 0.87 In. So beautiful and so believable! People ask "what did you do to deserve that??" Very good quality, great weight! I just can't find anything negative to say about it! It is a very beautiful ring with clear stones but the main stone is very large and the size alone makes the ring look fake. I really love this ring! I've had many compliments on it. When the band started to change colors, I bought a second one like it so no one would notice it! Is there anything I can do to prevent this on my new ring and others I've purchased? This is a beautiful ring. Sadly I had to return it. The main stone was just too big for me. I have small hands and the stone was too much. Nice sparkles and looks same as my real 6 carat ring. I am totally satisfied because many times the non diamond rings are prettier than the high price rings. Photo looks appealing -- drew me in right away and I purchased it. When it arrived, I was startled that it is not made of the good quality that the photo suggests. It looks fake and cheap. Other reviews that I read said the stone looks real. It doesn't -- not by a long shot. If you are looking for a high quality zirconia ring, I would carefully search for a better alternative. The only dislike I have on this ring is that it doesn't fit life a size 6 it feels more like a size 5, but other than that, the ring is beautiful and I love it! I would recommend this ring! 😃 This is the ring that I bought and I'm wearing it with one of my silver bands and it looks great together! Although I'm not engaged this is more than just an engagement ring. It has a beautiful and elegant look that I have been hoping to find. This ring is quite an eye catcher. Many compliments and it looks as much like a real diamond as anything can at 6 carats! My ring has not turned colors. It's still beautiful. I will send it back the ring is nice but the stone is to big I didn't think it would be this big. LOVE IT! BUT ITS REALLY LARGE! 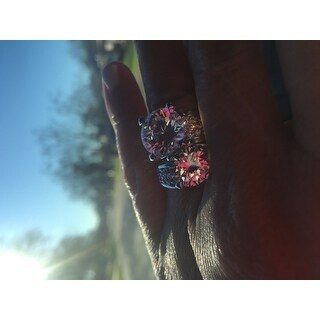 I have a chubby hand and for that reason I love big rings etc.. but this ring really blew me over.. It is LARGE.. it will definitely call attention. 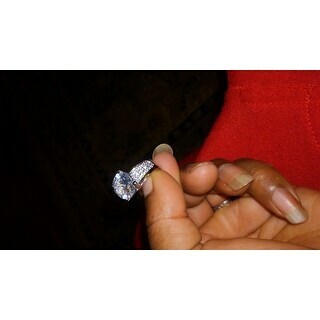 If you like that this is your ring.. Its Gorgeous but it is very very large.. but it looks amazing! I bought this ring for myself....told the grandkids that grandpa gave it to me....just because. I thought they would laugh....instead they are fighting over who gets it in the will!!!! Love it! While it is a bold piece, it is still elegant. Enjoy it! The stones and the platinum look real. I received a lot of compliments when I wore it to a concert. Very elegant and nice to wear everyday. Great value for the price. Had it just a little over the return period and center tone was turning and loose in setting. Sent it back, Overstock customer service was great as always. This ring look amazing and fits perfect so happy I found this it’s a little bigger than I like but I still wear it all the time! I live wearing it with and dress this ring looks amazing with any outfit! Beautiful ring! I love to wear it. Am returning. The stone is too big and the ring swims on my hand. "Will this ring cause my finger to turn green - please be honest "
I love this Ring! It has not turned my finger green, and I wear it often. I have a beautiful, large wedding ring, and I wear this as an alternative, so as not to damage my real one. I highly recommend this ring. the ring was to small I sent it back but I've got other and there were fine. "Is there a ring size 6 available soon? can you resized it? Thanks." Hello Van3, items are restocked as they become available; however, we cannot guarantee an item will be restocked. We do apologize, we do not currently offer resizing services. Please feel free to contact us again with any further questions. Thank you for shopping with us! "Will u be getting more of this rings I am looking for a size 7"
Hello Patty F., items are restocked as they become available; however, we cannot guarantee an item will be restocked. Thank you for shopping with us. "How fast will the silver wear off of the Brass?" "This will not turn your finger green correct?" Hello Pnavarrete, no, this will not turn your finger green. Thank you for shopping with us! "How many carats is center stone?" Hello kassie, the center stone has a diamond equivalent of approximately 6 carats. Please let us know if you have additional questions. Thanks for shopping with us. This is my first time order jewelry here. Hoping this is good.